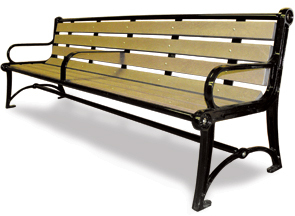 Terraza Style benches combine classically styled cast aluminum leg frames with durable recycled plastic planks that look like real wood and are environment friendly. The steel frame that supports the planks attaches to the castings with security hardware. 2" x 4" Recycled Plastic Planks.